A kid-friendly mystery with great characters to guide you through. The famous Sherlock Holmes employs three orphan boys. Their mission: to help him figure out who is kidnapping certain London children and why. Dubbed “the Baker Street Brigade”, Danny Wiggins, Peachy Carnehan, and Duff Bernard delve deep into the mystery, leaving no stone unturned in their search for the missing children. Holmes still has come of the characteristics from the original stories, but he has his soft side. He is concerned for the kidnapped children and cares for his troop of “irregulars”. Danny, Peachy, and Duff are more than willing to help wherever they can. Duff is mentally slower than most, but he has a big heart. Danny and Peachy watch out for him and are patient with him. Danny and Peachy apologize after a fight. The Waterloo Road Ragged School, where the boys reside, is run by good people who teach them what’s right. Obviously, the kidnappings are not moral. There is also talk about slavery in Sudan. The Brigade members are Christians. Those who run the Ragged School are as well. Children are grabbed, bound, gagged, chloroformed, and locked into suspended cages. The Brigade’s employer is beaten (unwitnessed) by the police in the pursuit of information. A girl bites a man’s hand in self-defense. Danny has a near scrape in a burned-out building. He chases a shady character, gets kicked, and passes out. Peachy is knocked unconscious twice (once intentionally). He knocks someone out with a fisherman’s gaff and is threatened by a tough sailor. Duff (firmly, but gently) hauls a couple characters up by either the collar or neck to stop fights. One man chases street rats away from his place, swinging items like clubs and threatening to stuff the kids. A policeman connects his cane with someone’s head. Someone throws bottles of acid (one victim dunks his head into a fountain after receiving a face-full off the stuff). The kidnapped are treated none too nicely. Holmes holds someone at gunpoint. None. Danny and Peachy have something of a crush on the same girl; later on, she embraces one of them in thankfulness but nothing more. 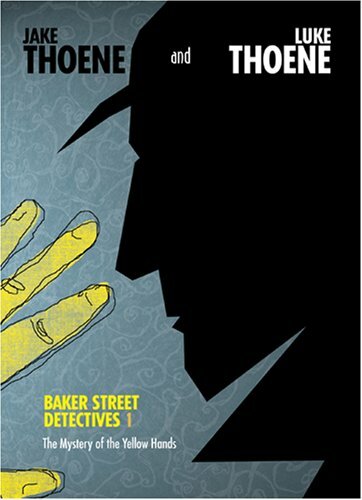 For those wanting to be acquainted with Sherlock Holmes without getting into the grisly originals yet, this is a great place to start. Detective principles such as not jumping to conclusions and planning before acting are good tips for even everyday life. Morals are strong and a gentle reminder that we all have a Father Who will never leave complete the package.